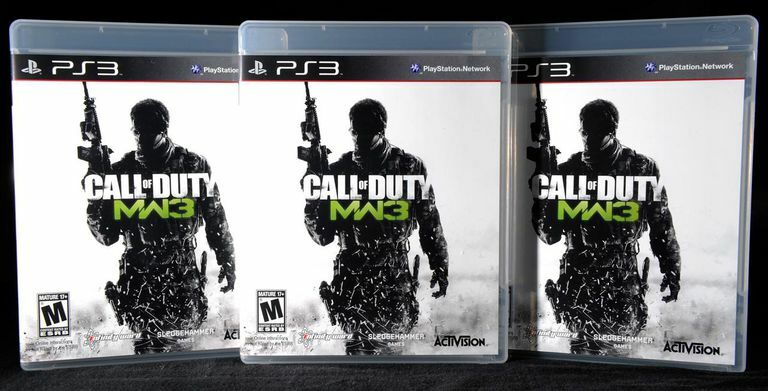 We currently have 'zero' working cheat codes for Call of Duty Modern Warfare 3 on the PlayStation 3. If you feel we've made this decision in error please let us know via our user discussion forums. As with all cheat code pages they now come with an optional User Submitted cheats, hints, and tips page. This will help you better solve problems through effective use of the community. Track down Volk. Complete 'Bag and Drag' on any difficulty. Find the girl. Complete 'Scorched Earth' on any difficulty. Escape the mountain safe house. Complete 'Persona Non-Grata' on any difficulty. Complete 'Bag and Drag' and 'Iron Lady' on Veteran difficulty. Take down a chopper with an AC-130 smoke grenade in 'Bag and Drag.'. Rescue the Russian President. Complete 'Down the Rabbit Hole' on any difficulty. Kill all 5 enemies during the zero-g sequence in 'Turbulence.'. Destroy all targets during the mortar sequence with only 4 shells in 'Back on the Grid.'. Defend the Russian President. Complete 'Turbulence' on any difficulty. Kill 20 enemies with the Chopper Gunner in a single run in 'Return to Sender.'. Destroy 3 tanks with a single 105mm shot in 'Iron Lady.'. Kill 9 enemies with A-10 strafing runs in 'Scorched Earth.'. Make it to Westminster. Complete 'Mind the Gap' on any difficulty. Complete 'Persona Non-Grata', 'Turbulence', and 'Back on the Grid' on Veteran difficulty. Complete 'Mind the Gap', 'Goalpost', and 'Return to Sender' on Veteran difficulty. Escape the city. Complete 'Blood Brothers' on any difficulty. Assault the shipping company. Complete 'Return to Sender' on any difficulty. Discover Makarov's next move. Complete 'Stronghold' on any difficulty. Complete 'Black Tuesday' and 'Hunter Killer' on Veteran difficulty. Complete 'Eye of the Storm', 'Blood Brothers', and 'Stronghold' on Veteran difficulty. Kill 30 enemies with the XM25 in 'Black Tuesday.'. Complete 'Scorched Earth', 'Down the Rabbit Hole', and 'Dust to Dust' on Veteran difficulty. Destroy the Jamming Tower. Complete 'Black Tuesday' on any difficulty. Infiltrate the village. Complete 'Back on the Grid' on any difficulty. Reach the church. Complete 'Eye of the Storm' on any difficulty. Escape Paris with Volk. Complete 'Iron Lady' on any difficulty. Save the US Vice President. Complete 'Goalpost' on any difficulty. Take back New York Harbor. Complete 'Hunter Killer' on any difficulty. There may be additional cheats, codes, hints, and tips for this game listed in our forums or our cheat code index. Have another cheat code, hint, or tip for this game? Let us know and we will add it to this page. You can submit a cheat directly to us, or post in the Video Game Cheats forum.